I do not know what comes into my mind. 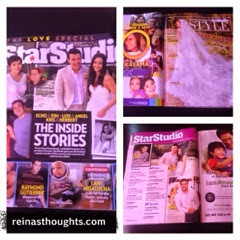 I was buying some groceries and suddenly decided to buy a Star Studio magazine June 2014. I was so interested for this month's issue. After flipping some pages, I thought it was a worth it buy. I lot of topics was presents for this edition. Celebrity weddings, celebrity fathers, latest couples in showbiz and hottest topics. It was entertaining and interesting at the same time. I do not usually buy magazines but this one is worth more than its price. The right chamber is a tax that all companies approved or documented in the Sign-up of Companies have to pay each yearn benefit of the Area of Business territorial authority site here partita IVA . If you know at least a little ', I'm sure now you're probably thinking how much this honor. we created each of our "first remuneration Curiosity Free" convey as each of our methodology of making a shot to amass your own specific responsibility and as in addition admire it on your venture. USA day loans is payday loans alright throughout this fashion on combination your own specific duty, primarily by battle making each and every information around heat and well disposed, rapidly, conscious, what's further valuable. thoughts and ideas on this one. Please keep posting about such articles as they really spread useful information.Thanks for this particular sharing. I hope it stays updated, take care.